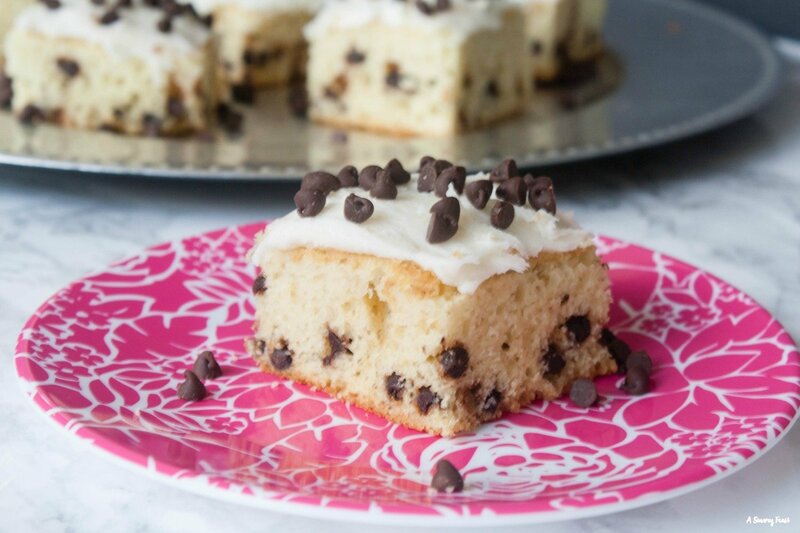 Mini Chocolate Chips turn this yellow cake into a fun treat for a party or shower! 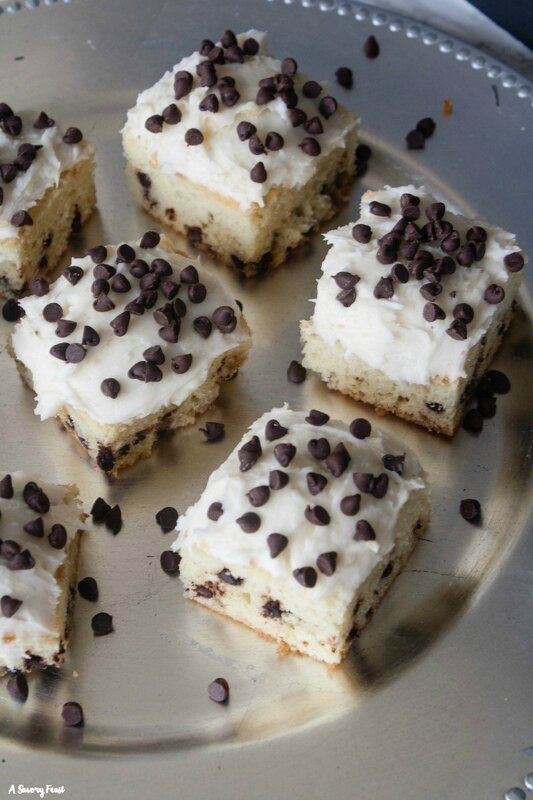 Chocolate Chip Snack Cake is a dessert that will feed a crowd. It starts with a yellow cake filled with mini chocolate chips. 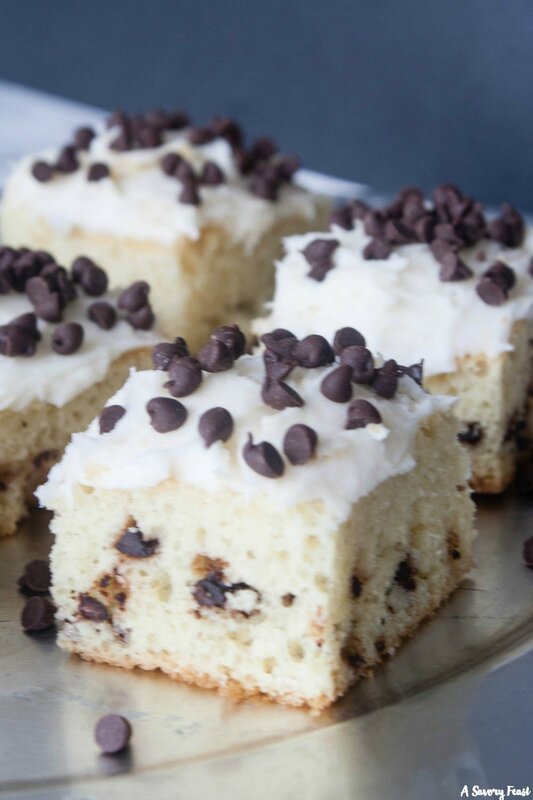 It’s topped with a cream cheese frosting and more mini chocolate chips. Today is a fun day here at A Savory Feast! 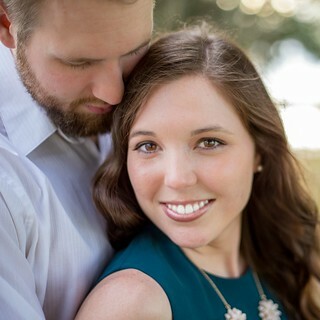 My blogging friends and I are throwing a virtual baby shower for Madison from A Joyfully Mad Kitchen. Madison is expecting her second baby boy any day now, so we are celebrating by sharing some tasty baby shower foods. Of course, cake is a must for a baby shower! 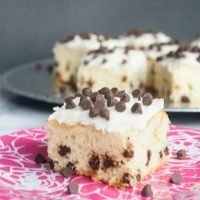 This Chocolate Chip Snack Cake is so easy to make. It’s great for a boy or girl baby shower or just about any party or celebration. 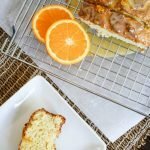 I tested out a couple different cake recipes to get just the right consistency for this cake. It’s a light, fluffy yellow cake that has just the right amount of sweetness. I am always up for something chocolate, and the chocolate chips in this cake add just a hint of chocolate. 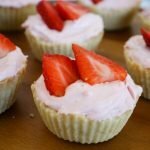 The frosting is made from cream cheese, which is my favorite kind! It has such a great flavor. After spreading on the frosting, the cake is topped with even more mini chocolate chips. Yum! There’s a special trick to adding in the chocolate chips so that they don’t all sink to the bottom of the cake. Take a little bit of flour and coat the chocolate chips in it before mixing them into the cake batter. If you are throwing a shower or party, a sheet cake is a great way to save time and make things easier on yourself. You don’t have to worry about creating a layer cake or taking time to do a lot of frosting or decorating. 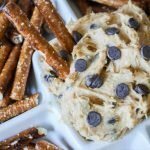 If you are throwing a baby shower, be sure to check out these other great ideas for appetizers, desserts, drinks and more from my blogging friends. The cake recipe is adapted from Sally’s Baking Addiction’s Yellow Sheet Cake. 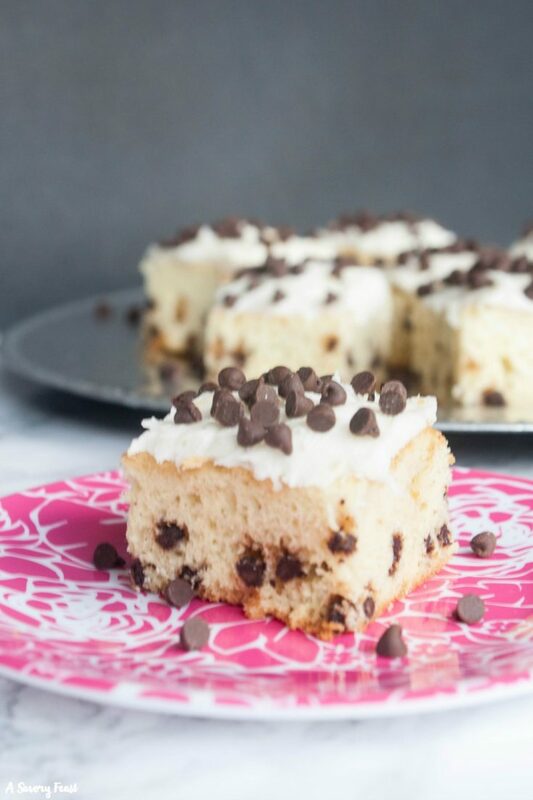 Serve up cute little slices of this Chocolate Chip Snack Cake at your next party! A yummy vanilla cake made from scratch with lots of mini chocolate chips inside. On top is a cream cheese frosting and more mini chocolate chips! Preheat oven to 350 F. Grease a 12x17 half sheet pan. Take 2 tbsp of the flour and place it in a small bowl with the mini chocolate chips. Toss to coat and set aside for later. This will keep the chocolate chips from sinking to the bottom of the cake. In a medium bowl, whisk together the remaining flour, baking soda, and salt. Set aside. In the bowl of your stand mixer, beat the butter on high until smooth and creamy. Add in the sugar and beat on high for 3 minutes so that it is fully mixed in. With your mixer on medium speed, beat in the eggs one at a time. On high speed, beat in the vanilla and sour cream. Slowly mix in the dry ingredients, alternating with the milk. Do not over mix. Use a spatula to fold in the mini chocolate chips. Pour the batter into the pan and spread evenly. Bake for 18-20 minutes or until a toothpick inserted into the center of the cake comes out clean. Let the cake cool completely. Beat butter and cream cheese for 3 minutes until fluffy. Mix in vanilla, powdered sugar and milk and beat for another 3-5 minutes. You can add more milk if it is too thick, or more powdered sugar if it is too thin. There are two ways you can do this. 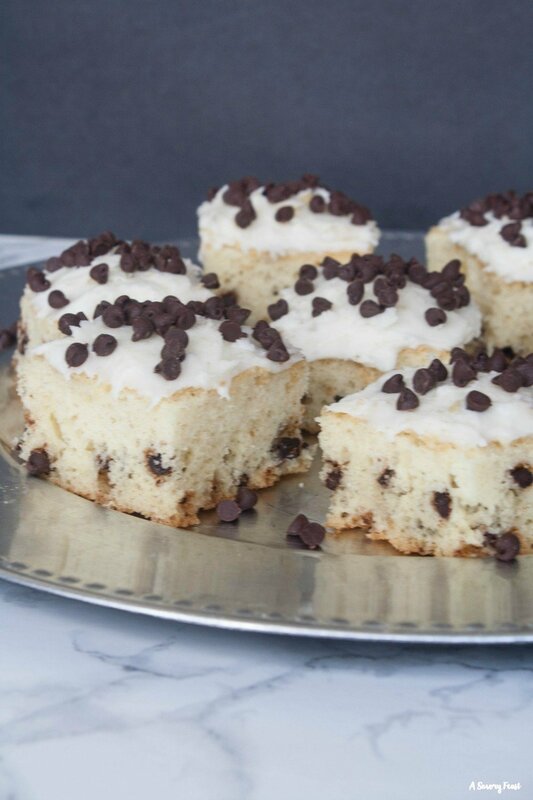 Either spread all the frosting over the cake, sprinkle with mini chocolate chips and cut into 1.5 inch square slices OR cut into 1.5 inch square slices and then frost each slice separately, sprinkling with chocolate chips. 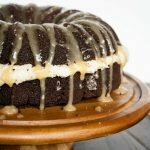 If you are making the cakes ahead of time, store in the refrigerator until you are ready to serve.